…baby fresh from the tub. My favs from the line Vintage Modern by Bonnie and Camille for Moda. She’ll be 3 months old tomorrow…how’d that go by so fast? Three months already? Wow! I love those little toes in the picture. Nothing like cute little baby toes! The little crossed ankles always get me-mine still do that at one! So sweet! She is beautiful! Babies just make me smile. Oh my goodness, that face, those toes, so sweet! It does go by fast, doesn't it…enjoy every moment. I love the pictures of your precious baby girl…Fabric is nice also..Where do you find the time. My kids are grown and I cannot find the time to sew or anthing. How adorable! Love those little toes! Enjoy these days! They are up and running around before you know it! 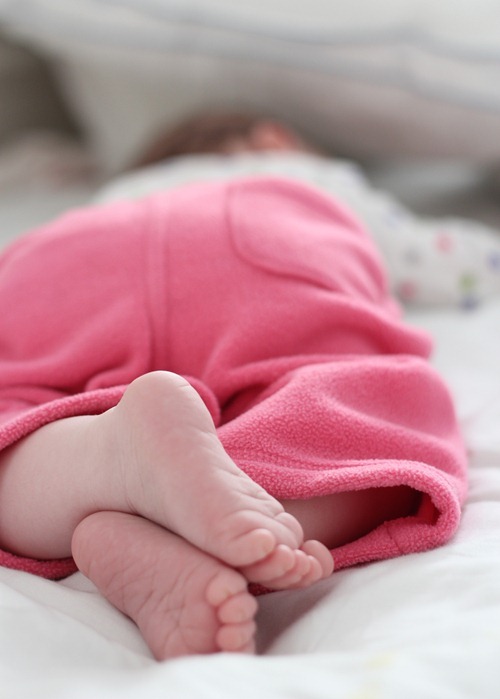 The fabric is okay–but your baby is just gorgeous! Such sweet little feet! Love your pics! She is beautiful! Have fun playing with your fabrics. what a little sweetie! And love the pictures of her cute feet! Sweet little baby toes! My baby is 2 1/2 and I have no idea where the last two years went. 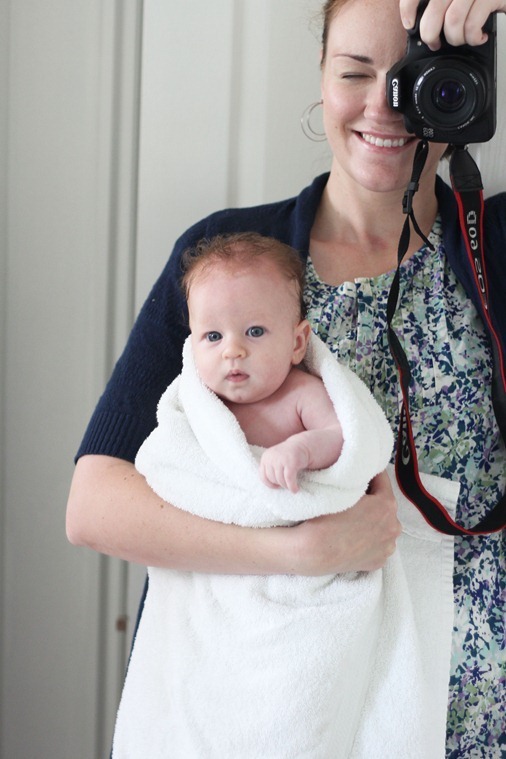 Awww… What precious pictures (the baby, not the fabric LOL)! Thanks for sharing! My "baby" is at his last day of middle school today. Wondering how THAT happened too! My "baby" just graduated from college. Treasure every moment! what a sweetie! My granddaughter is almost 2 and I can't believe how fast the time has gone! You won't know this, you have to think she's gorgeous cos you're her mum. I just have to tell you, you're not biased – she is gorgeous! No kidding…the time has flown by! She is getting cuter all the time. And love the fabric too. I really need to get my hands on some of that fabric for a summer project. She is just beautiful!!! So sweet! I had three little girls and the oldest is now 23. Cherish this time because it does go fast. Ohhhh, those toes!! My babies are 34 and 22 and I love them even more than when they were babies, BUT I'm sure ready for a grandbaby any time now!!! my baby will be 3 months on the 13th … it's going so fast huh?! OMG! What a cutie! There is nothing better than holding a baby… Great pictures!!! Oh dear! Even my granddaughters are past the baby stage now (the youngest is 6) and you've gone and made me feel all broody!!! Now what do I do??? Your baby is absolutely GORGEOUS! Enjoy her while you can – as a Grandmother I can tell you that while you're a Mum everything seems so important that most Mum's don't take enough time enjoying their children but when you're a grandparent, you realise how PRECIOUS they really are! Oh my gosh what an adorable baby! Thanks for the blog, it's my fav! That baby is a keeper. She is beautiful. To heck with the fabric, the baby wins!!!! Time does fly when you are raising children. Mine are old enough to become grandparents too. Where has all this time gone???? your baby is so sweet! enjoy every minute. ohh i love the smell of fresh washed baby. cherish these days, they do seem to go by fast. she is such an adorable little thing. Oh, she is so sweet. The pics make my eyes water. I remember my baby girl now grown. Yes the months go by too, too fast. Thank you for the pics. She's a sweet heart. Felicidades tienes una bebita preciosa. And what are your plans for the Vintage Modern? i'm getting some, but can't decide on a pattern and am looking for something to say YES! to me. 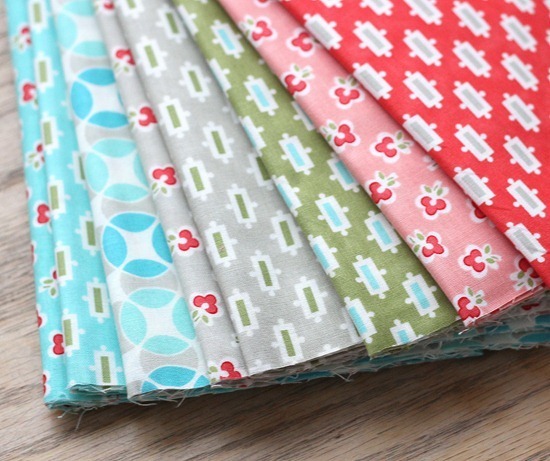 Would you share your ideas for that fabby fabric with us? THANKS! Oh my gosh she's adorable!! Great photos. And yes the fabric is purty too. oh she is a doll! miss those baby days, but not ready for grandbaby days. My baby days are behind me and I'm now a grandma, I love the fresh from the bath, lotion and powder. Love your fabric choices too. That is one sweet baby picture! Two actually! What a precious little girl you have there. They grow so fast. Mine are 13, 8 and my baby is 2.5. I love the greyand green one! Your little girl is precious! Can't wait to see what you will create with my current favorite line, Vintage Modern! that picture is just killing me! so beautiful. i miss those days of tiny little baby feet, all curled up! you should frame that one!! I remember writing to you when you just got out of the hosptial with her..Seems like yesterday. Love this sweet picture.